“Siri, what’s the weather forecast?” “Alexa, turn off the radio.” Consumers are quickly getting used to ordering their digital helpers to operate their smart devices. But soon it may be possible merely to think our commands. Subvocalization is something we all do when we internally verbalize words, as when reading to ourselves. Turns out, the process triggers neuromuscular signals in the jaw and face, as if we were talking out loud. 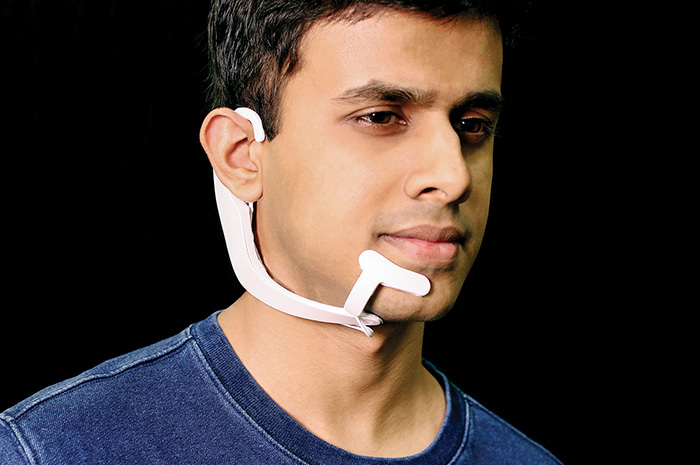 Now student researchers at the MIT Media Lab have figured out a way to pick up and decode those signals using a headset they’ve developed that has four electrodes placed along the jaw. A machine-learning algorithm can be trained to match particular signals with particular words. The system, dubbed AlterEgo, also can send vibrations back to the facial bones via the headset, which then travel to the inner ear, allowing a user to “hear” a response. The prototype has a limited, 20-word vocabulary, but the team is adding data from more elaborate conversations. The system potentially could give individuals with speaking disabilities a way to talk by sending subvocalized words to a synthesizer. Other uses might include improving ways for workers to communicate in noisy environments or enabling special-ops soldiers to “talk” to each other without betraying their presence. 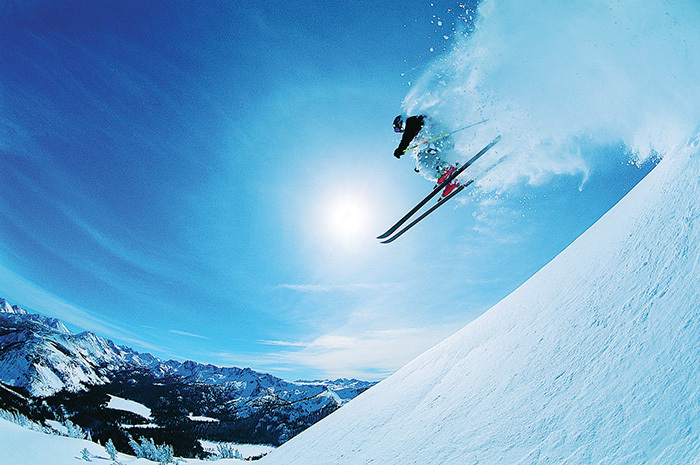 – T. G.
Skiing and snowboarding can be hard on knees, especially for athletes 45 and older. Now comes San Francisco firm Roam Robotics to the rescue with a soft exoskeleton that reduces leg strain on the slopes. The device’s embedded sensors anticipate a skier’s or rider’s movements, then activate an air bladder that adjusts torque, creating a counterforce on the leg between the top of the boot and the quadriceps. That allows users to move without putting as much strain on their joints. The device will come with a smartphone app that allows for manual torque adjustment and also provides performance stats. The company, which expects to start selling the exoskeleton next winter for around $2,500, says that pros also may want to use the system so they can stay on the slopes longer during training. – T. G.
The eye of the morpho butterfly has specialized nanostructures that allow it to sense multispectral images, including near-infrared. Now researchers at the University of Illinois at Urbana-Champaign, led by electrical and computer engineering professor Viktor Gruev, have developed a camera using the same kind of nanostructures that can simultaneously register regular and near-infared color images without having to dim room lights. 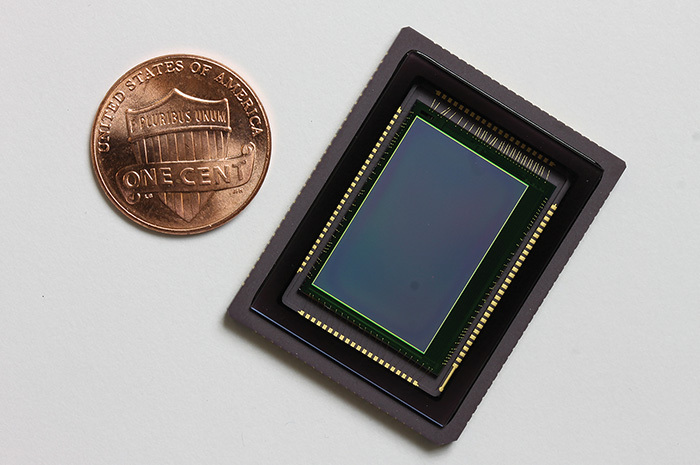 The camera, which they’ve integrated into surgical goggles, will help surgeons better detect cancerous tissue. While there are devices that pick up near-infrared fluorescent agents that bind to tumors, making them visible on display screens, the screens can be seen only in dimly lit rooms. At $20,000, the machines also are expensive and too big for many operating rooms. In tests, Gruev’s $200 goggles allowed surgeons at Washington University in St. Louis to detect breast-cancer tumors in mice and humans. Doctors often must find and biopsy or remove lymph nodes near a tumor to determine if the cancer has spread, and they typically use green dyes that not only make it easier to spot the lymph nodes but also emit an infrared signal. The camera enabled the surgeons to locate the nodes much more quickly, and in two cases find nodes they otherwise would have missed. Both turned out to be cancerous. – T. G.
Traffic is a major source of noise pollution, which research shows can not only damage hearing but also upset natural rhythms and cause blood pressure to spike. Highways use heavy concrete walls to muffle noise, but the hard surfaces also allow sound waves to bounce back to the roadside. Moreover, traffic generates a wide range of audio frequencies. 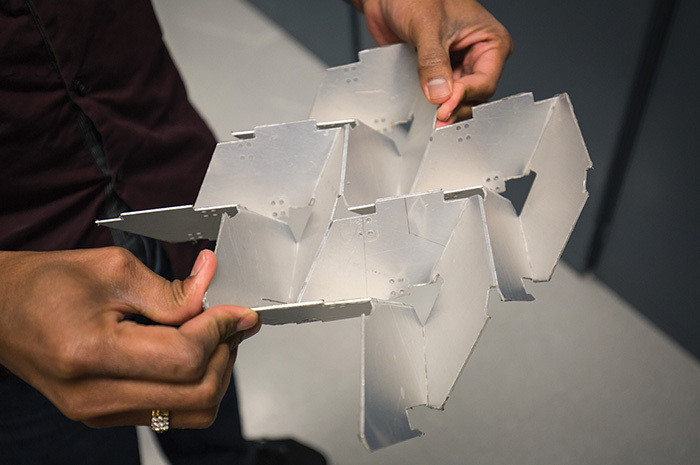 So Kon-Well Wang, a professor of mechanical engineering at the University of Michigan, and Ph.D. student Manoj Thota have come up with a lightweight, folding structure that can be tuned to reduce traffic sounds at a variety of frequencies. The structure’s base uses an accordion-like origami lattice, with aluminum tubes rising up from its creases. As the folds in the base collapse or expand, the tubes move closer or farther apart, diffusing noise in different frequency ranges. Their prototype reduces acoustic pressure by 10 decibels, or 90 percent, and traffic noise that otherwise would travel up to a mile is limited to just 0.3 miles. Wang and Thota based their work on a vertical, tubular sound barrier system used in Eindhoven, the Netherlands. But that system is fixed in place and thus less effective when cars are zooming past and generating a wide variety of frequencies. – T. G.
Episodic memory is new and useful information—such as where you parked the car—that we retain for a short period of time. It’s also the most common type of memory lost by people with Alzheimer’s disease, strokes, or head injuries. 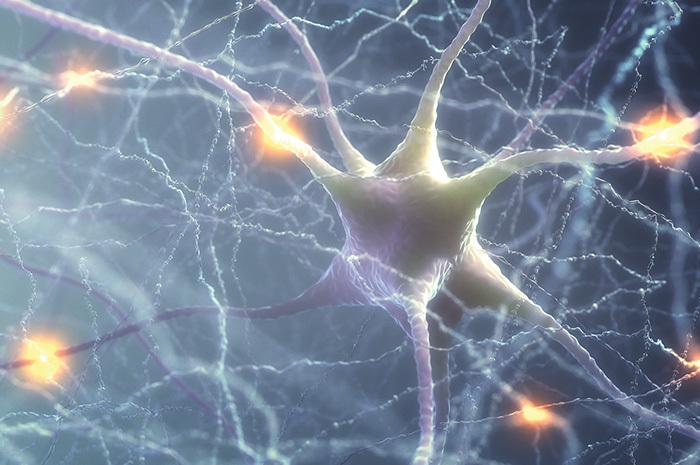 But now neurologists at the Wake Forest Baptist Medical Center, working with bioengineers at the University of California, have developed a neural prosthetic device that can identify a person’s memory patterns and recode them to work better. The research involved eight epilepsy patients with surgically implanted electrodes in various parts of their brains to help locate the origin of their seizures. The prosthetic system allowed researchers to influence the firing patterns of multiple neurons in the hippocampus, the area of the brain where memories are formed. The patients were then given memory tests, and the team was able to discern their brains’ code when they gave correct responses and then synthesize that code. The synthesized codes were then played back to the patients, improving their performance in the first retake of the test by 37 percent and by 35 percent in the second. For now, the researchers are trying to see if they can improve memory skills people still possess. Eventually, however, they hope to help people retain specific memories—such as where they live or who their grandchildren are—when their overall memory begins to falter. – T. G.
Most humans learn to walk as toddlers, usually without any great danger to themselves. But youngsters who are blind or visually impaired run the risk of tripping over objects they can’t see or walking into trees and walls. As a result, they tend to be overly cautious walkers, which research shows can also delay their learning how to talk, play, and socialize. 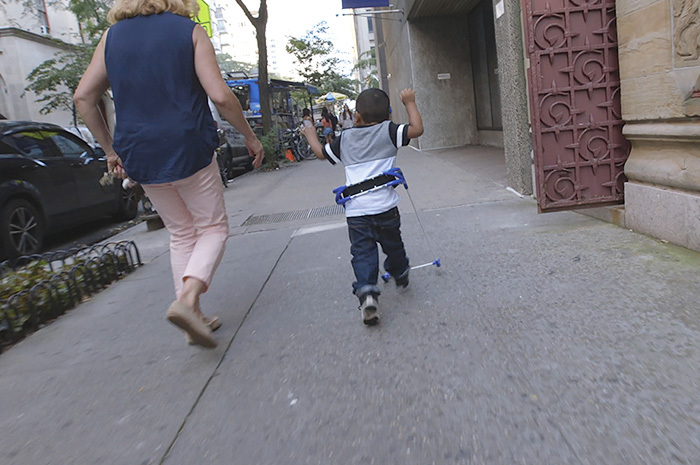 Since toddlers lack the cognitive skills or dexterity needed to wield a cane, researchers at the City University of New York have invented a wearable alternative. The “toddler cane” fastens around a child’s waist and has two white shafts that are joined by a U-shaped, ground-level bumper two steps ahead. Grace Ambrose-Zaken of Hunter College, who coordinates master’s programs in rehabilitation teaching and orientation and mobility, got the idea four years ago when it hit her that a device worn like a hoop skirt might work. She eventually partnered with Marom Bikson, a professor of biomedical engineering at City College, to perfect the design and produce prototypes. The two have conducted research that shows the toddler cane may help blind youngsters avoid developmental delays as well as learn to walk more quickly. They hope to conduct more clinical trials and work on reducing manufacturing costs. – T. G.
Sometime between May 5 and June 8, NASA is planning to launch its latest Mars lander. Unlike previous robotic explorers that either orbit the planet or rove its surface to relay atmospheric and topographical information, the InSight lander is larded with sensitive instruments designed to dig deep into the Martian interior for the first time. The mission’s goal: Study the size, thickness, density, and overall structure of the Red Planet’s core, mantle, and crust, and also determine how quickly heat escapes from its interior. The data will provide a better understanding of the evolutionary processes of all the rocky planets in our solar system. Meanwhile, a future Mars mission may include sending robotic bees. The Marsbees would be around the size of a bumblebee and feature cicada-size wings as well as a miniature video camera, sensors, and wireless communication device. 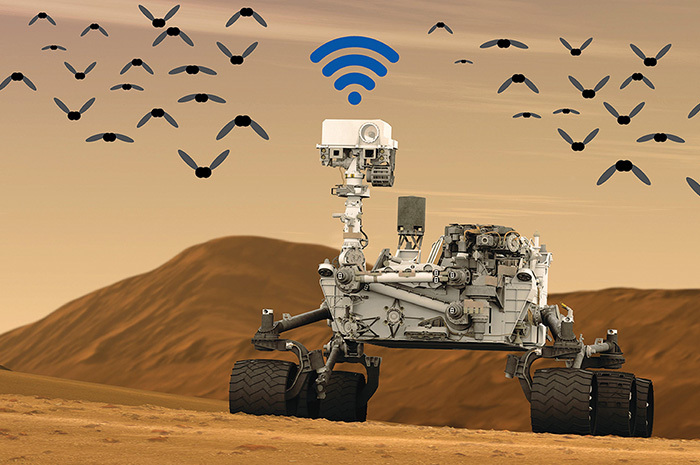 They’d fly in swarms and could be used to create 3-D maps to help guide a rover over the rugged Martian terrain. 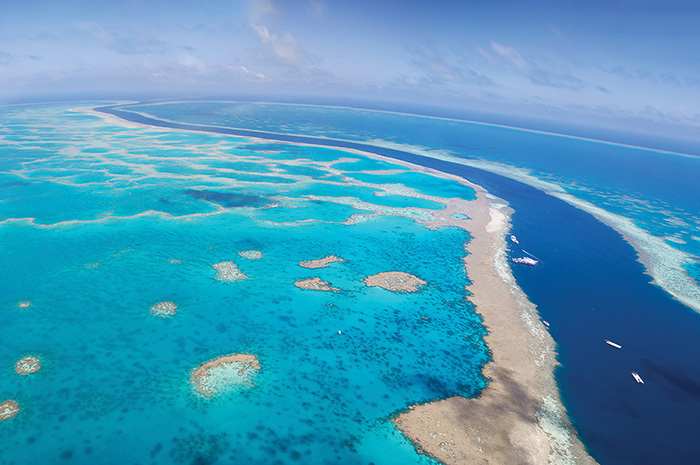 They could also be used to measure the atmosphere’s temperature and chemical composition. Chang-kwon Kang, an assistant professor of mechanical and aerospace engineering at the University of Alabama in Huntsville, recently won a nine-month, $125,000 Phase 1 NASA Innovative Advanced Concepts grant to determine if his flapping-wing design would give the robotic bees sufficient lift in the low-gravity Martian environment—news that generated a fair amount of media buzz. – T. G.
Methane, a component of natural gas, can leak from gas and oil wells. The odorless, invisible gas also is hard to detect and traps 84 times more heat in the short term than carbon dioxide—a powerful greenhouse gas. Moreover, leaks hurt utilities, which are pivoting from coal to natural gas. The Environmental Defense Fund (EDF), a nonprofit advocacy group, says fixing methane leaks can be an easy, relatively cheap way to drastically reduce greenhouse gas emissions, and recently held a contest to find an inexpensive detection technology that can be used at wells. The winner was Quanta3, a start-up run by two University of Colorado research scientists. Its solar-powered device uses a tuned laser beam that detects methane by the way its molecules absorb the light. Quanta3’s founders spent four years finding a way to reduce the cost of the necessary equipment from hundreds of thousands of dollars to a few thousand. It’s now piloting the device with Shell and Norway’s Statoil. Meanwhile, EDF joined with Stanford University’s Natural Gas Initiative last fall to launch another contest to find mobile detection devices. 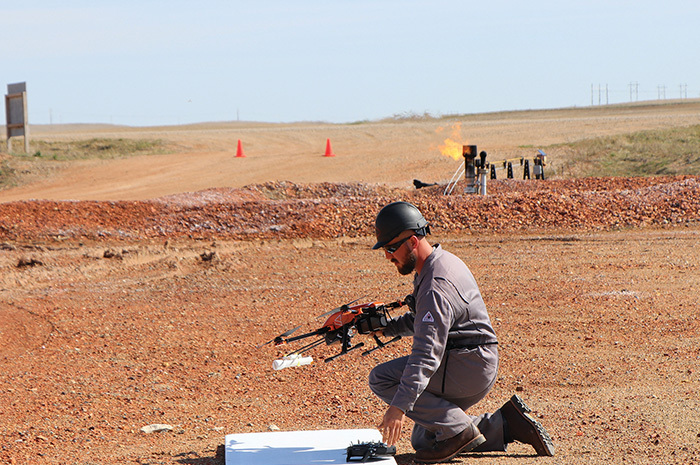 This spring, it invited 11 contestants to put their technologies through controlled tests. And in April, EDF announced it had obtained most of the tens of millions of dollars it needs to launch MethaneSAT, an orbiting satellite that can detect emissions worldwide with high resolution and pinpoint accuracy. It hopes to shoot MethaneSAT into space in late 2020 or early 2021. – T. G.
Imagine an automotive suspension system that works so well it has to be toned down so drivers can still get a feel for the road and brakes. That’s pretty much what ClearMotion, a Boston start-up launched a decade ago by three MIT students, has developed. 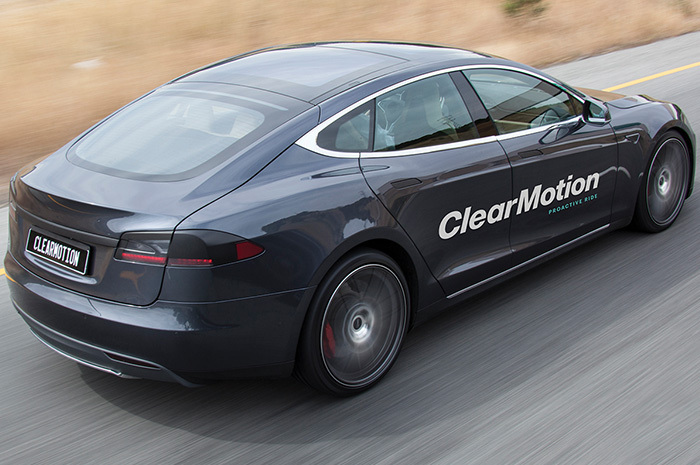 ClearMotion’s technology uses predictive road-sensing software that’s fed in near-real time with data from a collection of sensors and accelerometers at each wheel to detect in advance when a car’s about to go over a bump, dip, or hole. 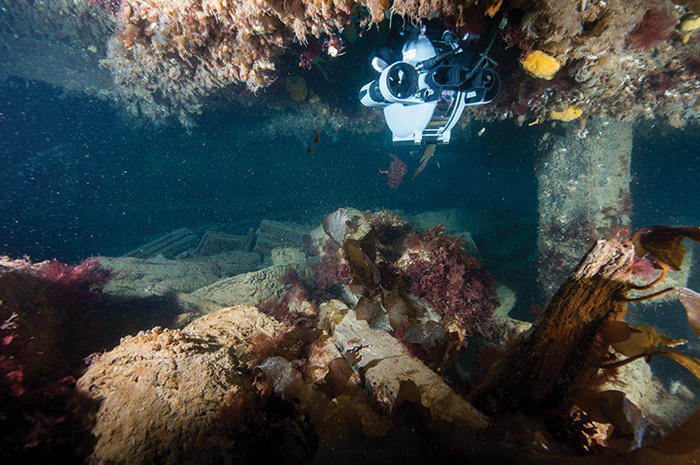 That info is sent, via the cloud, to the four devices affixed to each shock absorber into which an electric-powered rotor quickly—within five milliseconds—pumps hydraulic fluids. That causes the wheels to lift or drop, depending on the obstacle, and the net effect is a very smooth ride. ClearMotion was founded in 2008 to market a device that generated electricity from shock absorbers as they handled bumps. The company soon realized there was a bigger, better market for technology that made shock absorbers work better. While the ClearMotion device is currently engineered to give drivers some road feel for safety purposes, that won’t be necessary if it is paired with self-driving cars. – T. G.
Black and white are America’s most popular car colors. But as automobiles become increasingly embedded with smart technology—including radar, which detects radio waves, and lidar, which picks up light waves—the radiation signals the sensors transmit can also be absorbed by dark paint, reducing their efficacy. But Pittsburgh’s PPG, one of the largest suppliers of paints and coatings, may have found a solution, according to the Economist. And its inspiration came from an unlikely source: eggplants. The vegetable’s purple skin lets infrared waves pass through; white interior flesh reflects it back. 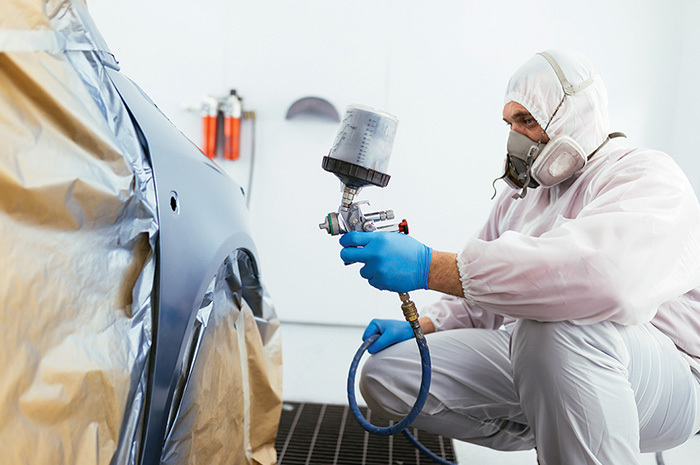 PPG is getting the same effect with dark paints whose pigments have been specially engineered to let through infrared light so it can instead hit a reflective white undercoating. The company has already developed dark paints that keep aircraft cool and says a similar approach can be applied to stop dark-colored cars from absorbing sensor radiation. – T. G.